Original Editors - Jamie Rife from Bellarmine University's Pathophysiology of Complex Patient Problems project. It is frequently seen in tropical regions, with prevalence as high as 40%; it is also common in temperate areas, representing up to 3% of patients seen by dermatologists during the summer months. Children age 0-15 years had a 17.8% prevalence of pathogens of the genus Malassezia in the skin. The highest prevalence of colonisation was 23.3% in infants age 0-18 months and 26.7% in 11-15 year-olds. The species of Malassezia that are involved are Mglobosa (77%-90% of affected patients in Spain, 55% in Japan, 25% in Canada), M. sympodialis (32%-42% in Spain, 9% in Japan, 59% in Canada). and M. furfur (11% in Canada). US National Health Survey data from 1971-1974 showed a prevalence of 0.8% among people 1-74 years old in the United States. Numerous spots and patches appear on the neck, upper back, and shoulder. The spots are covered by a fine scale. The spots vary in size. In summer, the spots are light and don't tan like the normal skin. 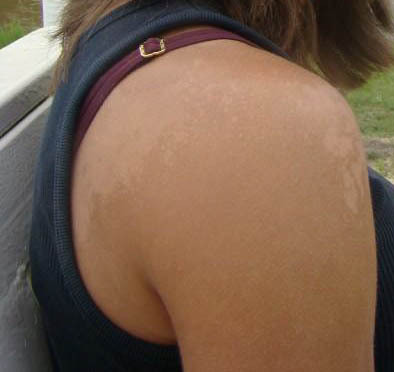 In winter, as normal skin tone fades, the spots look darker than normal skin. "Patients with tinea versicolor usually have many irregularly shaped slightly scaling macules and patches, generally covering large areas of the body and seperated by skip regions of normal skin. The macules and patches are yellowish-brown, pale yellow, or dark-brown, occasionally reddish or pinkish, appearing hypopigmented or heyperpigmented." Individual patches usually display a fine scale where the surface can appear to be smooth and shiny or dull. "Affected areas include the chest, back, neck, and face; however, patches are usually most abundant on the back. Facial patches are more common in children than adults." "Patients usually present in the late spring or summer in temperate zones and may state that this is the rash they get every summer." Both dermatologic and non-dermatologic comorbidities exist with tinea versicolor. "Common comorbid dermatologic conditions included: acne, dermatitis, melanoma, dyschromia, benign neoplasm of skin, seborrheic dermatitis, psoriasis, and dermatophyte infection. Common non-dermatologic conditions included: injury to blood vessels, elective surgery, hypertension, gastroenteritis, upper respiratory tract infection, multiple sclerosis, and HIV infection." sulfide (18%), clotrimazole (9%), miconazole (4%), and econazole (4%). Medications Not Approved by the FDA for Treatment of Pityriasis Versicolor Include: a variety of antibiotics, corticosteroids, anti-viral medications, and pain medications. Topical treatments are generally preferred for tinea versicolor, especially when treating children. "Oral drugs such as ketoconazole, fluconazole, and itraconazole have sometimes been used, with cure rates as high as 97%." Topical Treatments: Selenium sulphide 2.5% is one possible topical treatment. It is applied for 7 days and then applied on the first and third days of every month for six months. It should be left on for 5-10 minutes before being washed off. Sodium thiosulphate 25% with salicylic acid 1%, propylene glycol 50% in water twice daily for 2 weeks, zinc pyrithione shampoo left in place for 5 min daily for 2 weeks, and ciclopirox 0.1% solution daily for 4 weeks have all been found to be as effective as selenium. Topical azoles such as clotrimazole 1%, bifonazole 1%, and ketoconazole 2% are also effective forms of treatment. For children a daily 3-week regimen of a shampoo containing 1% bifonazole daily for 3-weeks is beneficial. Systemic Medications: Ketoconazole, itraconazole, and fluconazole: however; azoles have rare but serious side effects and therefore should be used with caution. Ketoconazole can either be given as 200 mg/day for 7-10 days or as one 400 mg dose. Itraconazole can be given with a total dose of as little as 1000 mg, given as 200 mg/day for 5-7 days. Fluconazole can be given as one oral dose of 400 mg.
"A Wood's light-a portable quartz lamp emitting low frequency UV light at 365 nm-is used to confirm the diagnosis and detect subclinical patches of fungi." This diagnostic method has only been positive in fewer than half of cases. Tinea versicolor is not a contagious disease and is not due to poor hygiene. "The infection results from a change to the mycelial state of dimorphic lipophilic yeasts of the genus Malassezia, which colonise the stratum corneum and are typical skin flora. Yeasts of this genus are found in regions of the body that are rich in sebaceous lipids, such as the head, trunk, and upper back." "Malassezia spp are present in 90-100% of people as typical flora; frequency and density of the pathogens are related to patient's age, regional sebaceous glands, and genital secretions", causing these species to be distributed unevenly on the healthy human body. "In both their normal and pathological forms, these pathogens reside within the stratum corneum and hair follicles, where free fatty acids and tryglycerides from sebum and keratinised epidermis might be altered in some way to provide a desirable host environment to primary or recurrent infection." See above section titled "Associated Co-morbidities". Physical therapists are not able to treat or diagnose tinea versicolor, but are able to recognize differences in skin pigmentation and can refer the patient to a suitable specialist. Case of a 14 year old male presented to a clinic for the treatment of acne vulgaris recalcitrant. 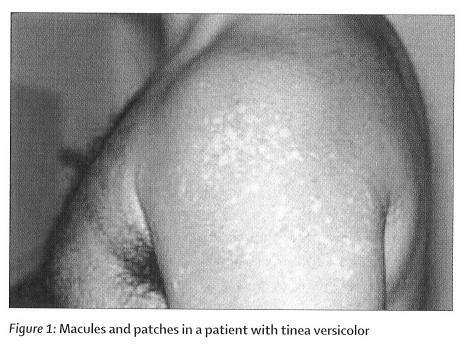 Upon examination a diagnosis of tinea versicolor was also made. The pt was started on treatment for his acne, but it seemed to help with treating his tinea versicolor as well. ↑ 1.0 1.1 1.2 1.3 1.4 Mellen LA, Vallee J, Feldman SR, Fleischer AB. Treatment of pityriasis versicolor in the United States. Journal of Dermatological Treatment. BMJ 2004; 15: 189-192. ↑ 2.0 2.1 2.2 2.3 2.4 2.5 2.6 2.7 2.8 Levin NA. Beyond Spahetti and Meatballs: Skin Diseases Associated with the Malassezia Yeasts. Dermatology Nursing. 2009; 21: 7-51.